Born in Portsmouth in 1937 Derek Boshier first came to prominence with his paintings as a student at the Royal College of Art in London where he studied alongside David Hockney, Allen Jones, R.B. Kitaj, and others. 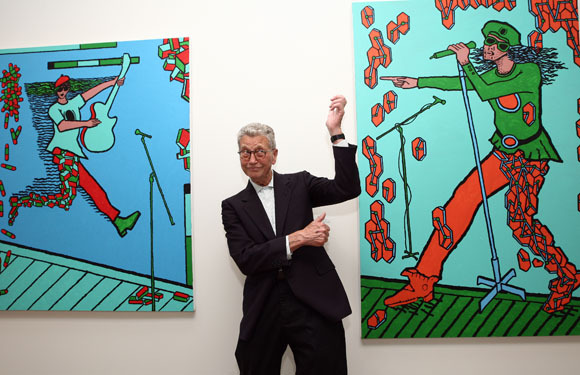 Embracing the iconography of British and American mass culture, his paintings earned him recognition as one of the pioneers of British Pop Art. In 1962, he was featured with Peter Blake, Pauline Boty and Peter Phillips in Ken Russell's BBC documentary 'Pop Goes The Easel'. Subsequently he has used other media:drawing, printmaking, film, books, three dimensional objects, installations and photography among them. His graphic work with popular music groups such as The Clash and with David Bowie have brought his work to a wider audience.